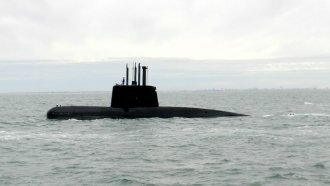 The Argentine navy still hasn't located a missing sub with 44 crew members aboard. Argentina's navy chief, Admiral Marcelo Srur, has been dismissed a month after failing to locate a missing submarine with 44 crew members aboard. Argentine news outlet La Nación broke the news Saturday. Srur's forced retirement comes amid heavy criticism about search efforts, specifically the lack of transparency. Some family members say they've had to find out updates through the media. Argentine President Mauricio Macri has answered that criticism by creating an investigative commission to research what happened to the missing sub. Reports say the budget for the commission is "unlimited." Family members have urged authorities to continue search efforts for the vessel, though international rescue efforts ended late last month. The submarine has been missing since Nov. 15, and authorities don't expect to find survivors aboard.